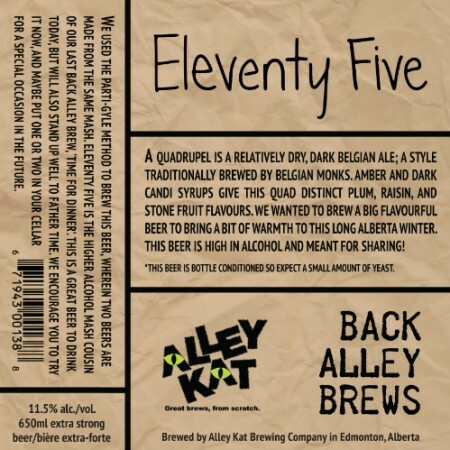 EDMONTON, AB – Alley Kat Brewery has announced the latest in the Back Alley Brews series of limited edition one-off beers. Bad and boozy, we’ve got a beer that will keep you warm on a cold night. Rich, dry and mysterious, our 8th Back Alley Brew leaves you with a lingering warmth in your chest and a spice that builds as you drink away. The kind of beer that you stay up with all night, pondering its complexity and savouring every moment, it ages like a charm, so we recommend setting some aside for the years to come. Eleventy Five will be officially launching on Thursday November 16th, and will be available in 650 ml bottles at Alley Kat and select retail stores in Alberta while supplies last. UPDATE: Alley Kat replied on Twitter to note that Eleventy Five is “still not quite ready for its release date”, so it will not be available this week as planned. A new date will be announced once the beer is ready.